High temperature rated, flexible, highly flame retardant, polyvinylidene fluoride printable cable markers. Excellent chemical and mechanical properties with low friction surface. 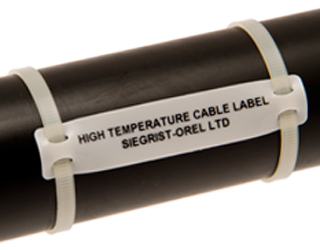 This cable marker is suitable in applications where extreme temperatures and exposure to harsh chemicals can be found. Markers are supplied in ladder form on a roll, having been conditioned for printing with our range of SUMIiTAG printers and qualified ribbons.